Early diagnosis of Tuberculous dactylitis is the key point to achieve good functional outcome. Department of Orthopedics, King Abdulaziz University Medical College, Saudi Arabia. 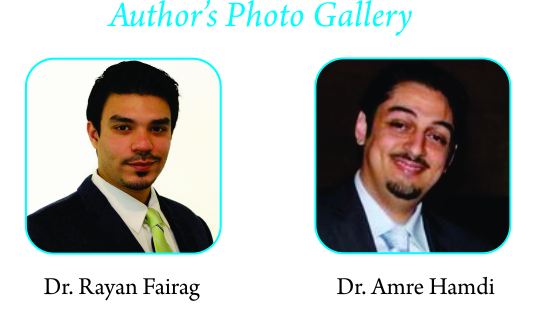 Department of Orthopedics, King Abdulaziz University, P.O. Box 80215, Jeddah 21689, Kingdom of Saudi Arabia. Introduction: Skeletal tuberculosis involving the small bones is less common than pulmonary tuberculosis. Tuberculous dactylitis involves the short tubular bones of the hands and feet more commonly in children. The bones of the hands are the one’s more frequently affected than bones of the feet, with the proximal phalanx of the index and middle fingers as the commonest sites for infection. Spread to the skeletal system occurs during the initial infection via the lympho-haematogenous route. 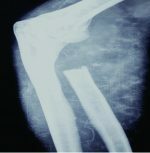 The radiographic features of cystic expansion have led to the name “Spina Ventosa” for tuberculous dactylitis of the short bones. We report a case of tuberculous dactylitis in the right little finger. Case Presentation: We describe a 36-year-old woman, who presented with a 12-month history of painless swelling of her right little finger associated with fever and night sweats. Her history was remarkable for persistent productive cough. On examination, her investigation reports and radiographs correlated with the symptoms of tuberculosis, suggestive of tuberculous arthritis. Magnetic resonance imaging of the hand was suggestive of osteomyelitis. Histopathological examination revealed chronic granulomatous inflammation that was consistent with osteomyelitis of the bone due to tuberculosis. However, acid-fast bacilli were not identified. Full course of anti-tuberculosis regimen was commenced. Monthly follow-up and radiographic examinations revealed improvement of the patient under this treatment. She also achieved a good functional outcome. Conclusion: Tuberculosis should be considered in patients with unusual soft tissue or skeletal lesions in order to make an early diagnosis and to achieve a good functional outcome. Although tuberculosis of the hand has a varied presentation, the majority of lesions respond to conservative treatment, as anti-tuberculosis chemotherapy is the cornerstone in the management of skeletal tuberculosis. Extra-pulmonary tuberculosis is less common than the pulmonary form, with an incidence of about 10%. The spine is the most frequent site of skeletal involvement. Tubercular infection of metacarpals, metatarsals and phalanges of hands and feet—also known as tubercular dactylitis— is uncommon, especially after the age of five years. Tuberculosis can present in different ways, and should be regarded as one of the possible diagnoses of several bony pathologies, including those of the metacarpals and phalanges. 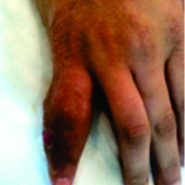 We report a case of tuberculous dactylitis in a healthy adult with no history of trauma. A 36-year-old female was referred to the orthopedics clinic with a 12-month history of painless swelling of her right little finger. The swelling increased gradually and started to affect her hand. She had no medical illness, or any history of trauma or injury to the hand. The swelling was associated with fever and night sweats. Her history was remarkable for persistent cough, which was progressive, productive and associated with yellowish sputum. The patient reported no history of weight loss. On examination, the patient had an erythematous, painless, swelling of the right fifth digit (Fig. 1 and 2), with full painless range of motion relative to the other joints of her hand. A provisional diagnosis was made of hand and finger infection, tubercular dactylitis, pyogenic infection, gouty arthritis, giant cell tumor of the tendon sheath, or fungal tenosynovitis. Laboratory investigations showed the following: white blood cells 6.42 × 109/L (reference range, 3.5-10.5 × 109/L); hemoglobin 12.7 g/dL. (reference range, 12.1-15.1 g/dL); platelets 303 (reference range, 150-450 × 109/L). Acid-fast bacilli examination of sputum was negative, while a plain X-ray of the chest (Fig. 3) showed an ill-defined nodular opacity with a small effusion in the lower left lobe of the lung (Fig. 4). 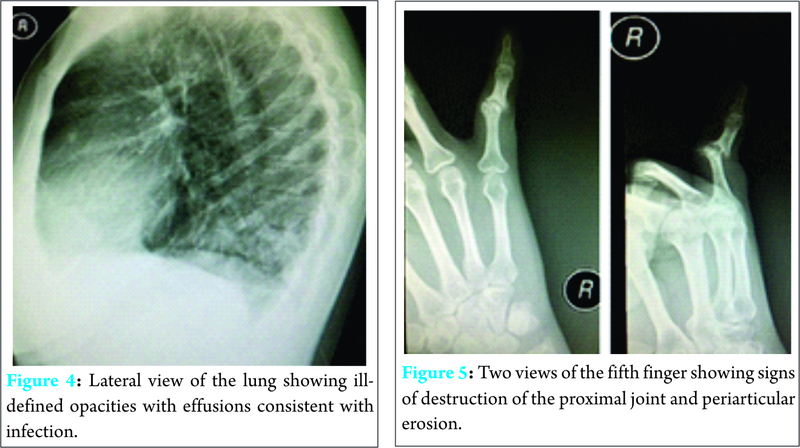 A plain X-ray of the right hand showed decreased proximal interphalangeal joint space with periarticular erosions and subluxation that correlated with the patient’s symptoms of tuberculosis, suggestive of tuberculous arthritis (Fig. 5 a and b). 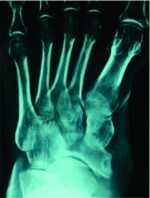 Magnetic resonance imaging of the hand was suggestive of osteomyelitis. A histopathological examination was performed with written consent of the patient. Granulation tissue was obtained from the fifth digit, over the proximal phalanx, and it was sent for culture (bacterial and fungal) and acid-fast bacilli examination. A swab was obtained as well and sent for culture. The examination revealed chronic granulomatous inflammation that was consistent with osteomyelitis of the bone due to tuberculosis. Acid-fast bacilli however, were, not identified. The patient was started on an anti-tuberculosis regimen comprising isoniazid 300 mg, rifampicin 450 mg and 40 mg of vitamin B6 for 18 months, and pyrazinamide 1.5 mg and ethambutol 800 mg for three months. Monthly follow-up and radiographic examinations revealed improvement of the patient under this treatment (Fig. 6a and 6b). She also achieved a good functional outcome without the need to use any type of splinting or support. Tubercular dactylitis is a rare presentation of extra pulmonary tuberculosis and it constitutes less than 1% of skeletal tuberculosis . It is more common in children, although it is typically uncommon after the age of six years. The disease is slowly progressive , and diagnosis is often delayed due to multiple factors, including the paucibacillary nature of the lesion, as smears are often negative; non-specific clinical manifestations of the disease; the ability of occurrence of the disease in the absence of pulmonary tuberculosis; the lack of a rapid microbiological diagnostic method; and poor awareness among treating physicians and surgeons who do not have much experience with this disease. Any delay in diagnosis and treatment of tubercular dactylitis would most likely decrease the chances of a good functional outcome, making diagnosis challenging . Early diagnosis and treatment are essential to retain optimal function. In our case, there was a mean delay in presentation and diagnosis of about two months, as the patient initially presented to the medical clinic before being referred to our clinic. The clinical features of tubercular dactylitis depend on the virulence of the organism, host response and anatomical area affected. Pain and swelling are the most common presenting features, followed by sinus discharges . Tuberculosis of the phalanges and metacarpals can mimic bone tumors and a histopathological examination is essential for diagnosis. However, the diagnosis is based on the clinical picture and radiographic features and should be confirmed by open biopsy and/or isolation of Mycobacterium tuberculi in the culture with positive Ziehl-Neelsen staining for acid-fast bacilli or detection by polymerase chain reaction . Treatment of tuberculosis of the hand is generally non-operative. Current recommendations for the treatment of tubercular dactylitis include a two-month initial phase of isoniazid, rifampin, pyrazinamide, and ethambutol followed by a six- to 12-month regimen of isoniazid and rifampin . Although, in our case the diagnosis had been delayed, treatment with anti-tuberculosis medication resulted in a good functional outcome. In our case, the outcome was similar to that reported by other authors , with several studies conducted worldwide reported that patients with tubercular dactylitis recovered fully following treatment with anti-tuberculosis medication; no recurrence was reported in these cases and none of these patients required surgical intervention [4, 8] as what happened in our case. Tuberculosis should be considered in patients with unusual soft tissue or skeletal lesions, especially when the patient is immunosuppressed in order to make an early diagnosis and to achieve a good functional outcome. Although tuberculosis of the hand has a varied presentation, the majority of lesions respond to conservative treatment, as anti-tuberculosis chemotherapy is the cornerstone in the management of skeletal tuberculosis. Diagnosing tuberculous dactylitis can be challenging especially in adults and should always be kept in mind while dealing with pathology of short tubular bones of hand and feet in order to make an early diagnosis and to achieve a good functional outcome. 1. Subasi M, Bukte Y, Kapukaya A, Gurkan F. Tuberculosis of the metacarpals and phalanges of the hand. Ann Plast Surg. 2004;53(5):469-72. 2. Karanas YL, Yim KK. Mycobacterium tuberculosis infection of the hand: a case report and review of the literature. Ann Plast Surg. 1998;40:65-67. 3. Ali N, Bhat A, Fatima A, Muzzafar K, et al. Tuberculous dactylitis: a case series and review of literature. J Pioneer Med Sci. 2014;4(4):184-190. 4. Kotwal PP, Khan SA. Tuberculosis of the hand: clinical presentation and functional outcome in 32 patients. J Bone Joint Surg Br. 2009;91(8):1054-7. 5. Agarwal S, Caplivski D, Bottone EJ. Disseminated tuberculosis presenting with finger swelling in a patient with tuberculous osteomyelitis: a case report. Annals of Clinical Microbiology and Antimicrobials. 2005;4:18. 6. Center for Disease Control and Prevention. Treatment of Tuberculosis. MMWR Morb Mortal Wkly Rep. 2005;52 (RR11):1-77. 7. Subasi M, Bukte Y, Kapukaya A, Gurkan F. Tuberculosis of the metacarpals and phalanges of the hand. Ann Plast Surg. 2004;53:469–72. 8. Benchakroun M, El Bardouni A, Zaddoug O, Kharmaz M, et al. Tuberculosis of the wrist: symptoms and outcome in eleven cases. Rev Chir Orthop Reparatrice Appar Mot. 2004;90:337–45.